Answering behavioral or scenario-based questions during an interview can be tricky, but it is important to be prepared in order to land your dream IT job. 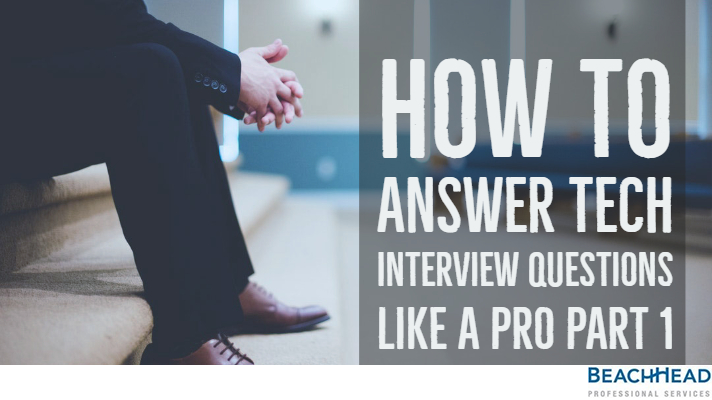 Read on, as we give you tips and tricks to answer most frequently asked technical interview questions. At BeachHead, our recruiters know that the best way to gain insight into a candidate’s interpersonal skills is to probe with a scenario or behavioral questions related to past experiences. Behavioral questions in the middle of a tech interview are not new. No matter your expertise, it is extremely difficult to react well to scenario questions without preparation. Therefore, preparation is key! At BeachHead, we have come up with a guide to give you an insight on how to best answer these questions and present yourself as “the” candidate for the job. When asking this question, the employers are looking for candidates who can explain a technical problem and how a code solved it. Common mistakes for the scenario based questions are focusing entirely on technology. They want employees who understand the bigger picture rather than focusing on technology. Although you should weave into your response your technical prowess, the employer is trying to figure out how you looked at the challenge and what was your overall approach towards fixing it. We suggest that you review your resume prior to the interview, keeping a number of scenarios handy where you were challenged both technically and interpersonally, worked well with others, and solved technical challenges. Then, practice answering the question, speaking out loud to yourself, slowly and clearly. Talk about the challenge, emphasize how you analyzed the situation and implemented the logical solution. Do not give vague answers (but ensure you maintain any confidentiality agreements), use the words “I”, “My”, “Mine” and “Me” where appropriate to describe the problem and resolution, and give credit for other team members (not names) where due. Please do not ramble, and remember to be honest. The goal of this question is to figure out what drives you, your passions, and innovation. This question is often used to ascertain not only technical skills but interpersonal skills as well….a double header!! It is also to analyze your planning skills, decision-making capabilities and analytical and logical reasoning. It is a very good practice to start preparing for these questions well in advance. Before sending out your resume, you should dig into each of your projects and figure out the work that challenges and motivates you. This also helps in getting a clear idea of the type of work that you want to do in the future. So, when the interviewer asks you about your most exciting project, focus on those projects that made you happy, excited and proud of your line of work. Talk about the project, the technologies you worked upon and the problems you solved. Focus on the skills you learned and how would you apply the same to their organization. With this question, the employer is trying to gauge your cultural fit into their organization and the team. They want to assess your emotional intelligence, and they also want to determine if you have conflict resolution skills. With this one question, the employer aims to identify your various skills like judgment, negotiation, honesty, following a corporate code of conduct, and loyalty to the organization. While answering these type of scenario questions, it is best to avoid talking about personal conflicts rather focus on professional disagreements. You should give a brief idea about the conflict, how you communicated your position, the way you listened to your colleague’s position and how you resolved the problem. It is also advised to discuss the positive impact of the conflict on your professional relationship with your colleague and how the outcome ended positively and professionally. You should be careful to demonstrate no bitterness or resentment. There you go! Follow our tips and take a step closer towards your dream IT job. Do remember that the best answers are clear and concise. They also demonstrate to the employer that you possess the technical expertise and the mindset needed for the role. So, prepare well in advance. This is our first installment in a 3 part series of how to answer tech interview questions like a pro. For more such questions and how to answer them, follow us on LinkedIn and Twitter, also like us on Facebook. Want to know the answer to a specific question? Send us your questions, and we will help you in crafting the best response. Want our help in getting an interview for your dream job? Send us your resume at info@beach-head.com. Heading for a job interview? Follow our 5 expert recruitment tips! Are you heading out for a job interview? Follow our 5 expert recruitment tips to ace your IT job interview like a pro! A well designed and thoughtful UX portfolio goes a long way in getting you that interview call. Want to know how to design a UX portfolio that can help you get hired? Read On. © 2019 BeachHead Professional Services, all rights reserved.